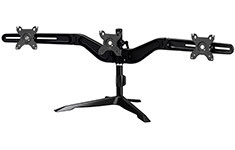 The Aavara DS300 is a Triple LED/LCD Monitor stand, featuring a wide angle of +/- 15 degree tilt, +/- 15 degree swivel and a 360 degree rotation. It supports VESA 100x100mm displays and ExperTorque technology enables adjustment of the screens hinged by its weight. The smart cable management system keeps messy cables in good order while two independent arms provide the perfect amount of adjustment for all home and office setups.